I love looking through old photos and taking walks down memory lane. I used to scrapbook and print off pictures to put into photo albums on a regular basis, so its fun to pull them off of the bookshelf and reminisce. I’ll admit that over the past couple of years I’ve gotten way behind on my photo albums, but hopefully I’ll get back on track soon since, let’s face it, its much more fun to look through albums and scrapbooks than it is to just scroll through pictures on the computer. This week’s Friday Five theme with the DC Trifecta is “Five Things I Was Doing Ten Years Ago.” Oh what a fun trip I took down memory lane last night as I wrote this post! 2. Working two jobs during my summer break. During the day I worked at my dad’s law firm as the summer receptionist while the college interns were on break, and on nights and weekends I worked at Old Navy as a Sales Associate. 3. Taking one community college class (World Civilizations) in order to get ahead on credits for my History degree. 4. Spending as much time with my high school friends as I could. 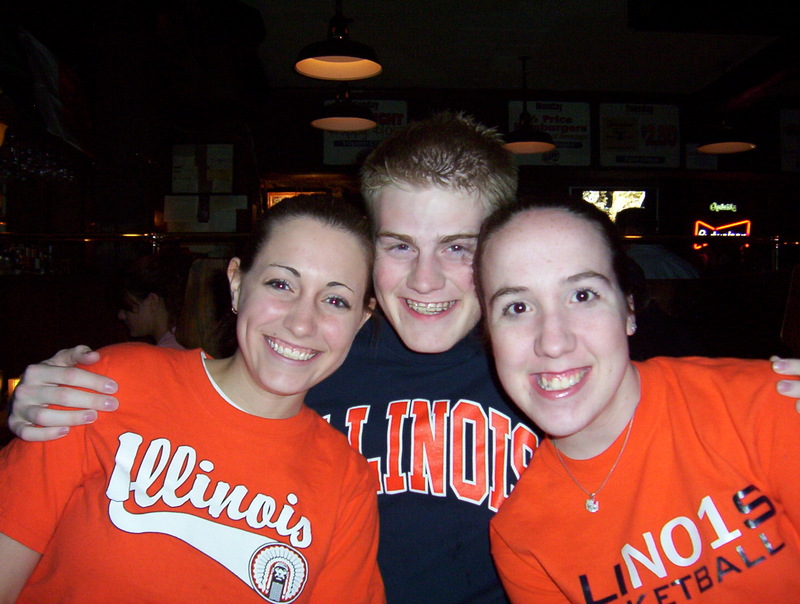 I was one of the few people from my close knit HS group that left Illinois for college, so on school breaks I spent as much time with my friends as I could. 5. Not running. Instead, I was still dancing. QOTD: What were you doing ten years ago? 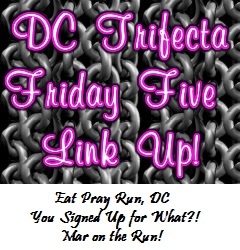 As always, thank you to the DC Trifecta Bloggers (Courtney from Eat Pray Run DC, Mar from Mar on the Run, and Cynthia from You Signed Up For What?!) for hosting the weekly Friday Five Link Up. Be sure to check out their posts as well! This entry was posted in Miscellaneous and tagged Friday Five. Bookmark the permalink. Woops….replied under a different name – but I guess you knew who this was haha. Oh how fun to look back! Let’s see…10 years ago I was super pregnant with my first child! He arrived July 27th! Can’t believe my baby is about to be 10!!! Its crazy how quickly time flies! Ten years ago, I graduated college, passed my NCLEX to become a nurse, started dating my now husband, and spent time with recovery efforts after Hurricane Rita. 2005 was an interesting year for sure! Sounds like 2005 was a very eventful year for you! Ha, I use to be faithfully with printing pictures an putting them in photo albums. Now I haven’t done that since we started the blog. You are right, not as much fun scrolling through pics on a computer! Sometimes its easier said than done! I miss the days of living at the pool and the beach. If only being an adult didn’t get in the way of that. What a fun theme. Let’s see 10 years ago I was heading into the summer before my senior year of high school – working 3 jobs. I remember getting so pumped when I had $500 in my bank account haha. I definitely don’t miss being a teenager. 10 years ago was big change. That summer I had my first internship instead of working soccer camps like I had for the 3 previous summers. Sounds like it was an eventful summer! Oh my gosh. 10 years ago, I was running (of course), raising my boys, working as a nurse, and going back to school to become a nurse practitioner. Wow, what a busy year! Wow high school seems like forever ago to me especially since my daughter just graduated from HS. Fun to look back isn’t it?! I was in law school, loving life in Charlottesville! I was definitely not running! Lol What’s funny is I was a cheerleader and danced. The rest is a blur! Its funny how time has both flown by and not at the same time. Wow, old picture! I’m sure you’ll get back into your photo albums once your baby arrives! How fun is this?!?! 10 years ago I was enjoying my first summer being 21 AND it was my first summer to not go home and stay at college. So you could only imagine what I was doing. Drinking too much and spending too much time with a boyfriend who didn’t matter. I surely wasn’t in on a Friday night commenting on blogs 😉 I like my life at 31 better than 21. I was running, being mom and not doing yoga. What was I thinking with NOT doing yoga? 10 years ago I was nearly 2 months into dating my now-husband, working at a job I only kinda liked, and trying to figure out how to finish university. I wasn’t active, wasn’t running, wasn’t doing much of anything. Oh how things have changed! Things have definitely changed a lot for many of us! Love all the pics from bloggers from 10 years ago. I was living in England 10 years ago enjoying all aspects of a different lifestyle! I can only imagine how different your life was while living in England. Omg I’m so glad that you’re past that!